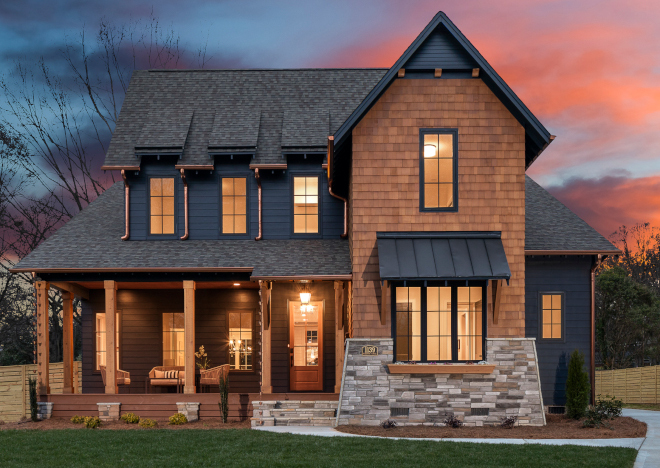 “Pike Properties was presented with a relatively flat lot with large dimensions, and therefore it was time to go about building something truly special. 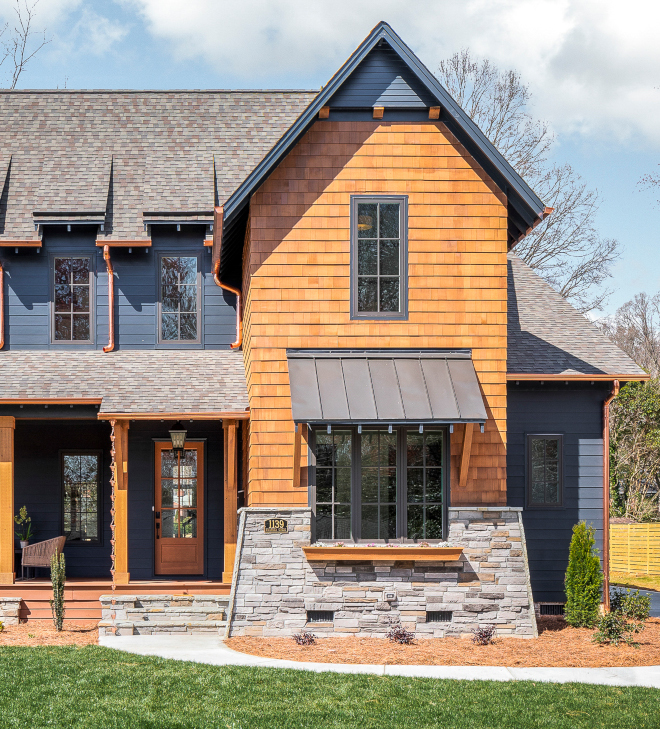 It isn’t uncommon for Pike to build a special home, but this home took everything to new heights and was full of new design ideas and concepts never before seen in Pike builds. One important thing to note is that Pike Properties isn’t a custom builder. We are purely building homes on a speculative basis. We buy the dirt, design the home, bring it to life, and sell it to its new owners. That said, many features you find inside this home and others we have built are at our additional cost. Did we need copper gutters? No. Did we need a stacked stone wing wall? No. These are the extra sizzle features we add to our homes to make them stand out and live up to our high standards. This home is so very eye-catching. The contrasting colors and boldness of the overall design ensures that brake lights come on as cars drive by and that people stop and let their dog sniff just a bit longer. 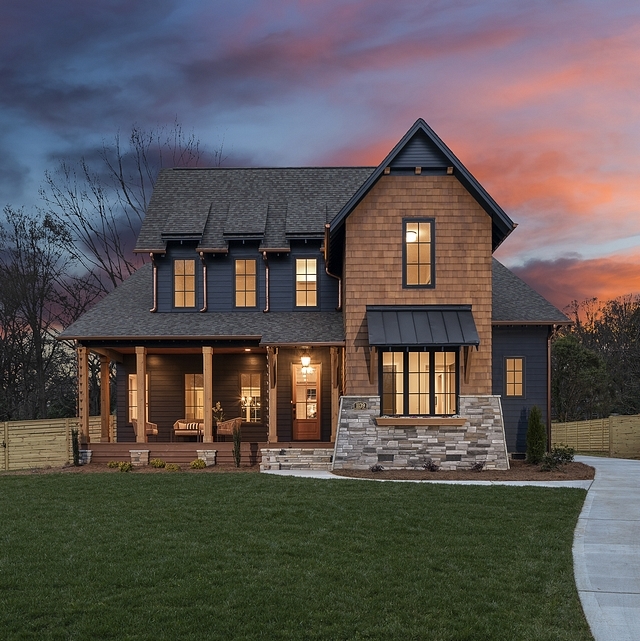 The overall design is actually just a slight tweak on this home: “Farmhouse-Style Home Inspired by Chip & Joanna Gaines“. Tired of white, white, and more white, Pike Properties decided to take a slight risk and go dark with the main body paint color (Benjamin Moore Raccoon Fur). This color is very unique and actually can look more dark gray in some lights and more dark navy at other times. 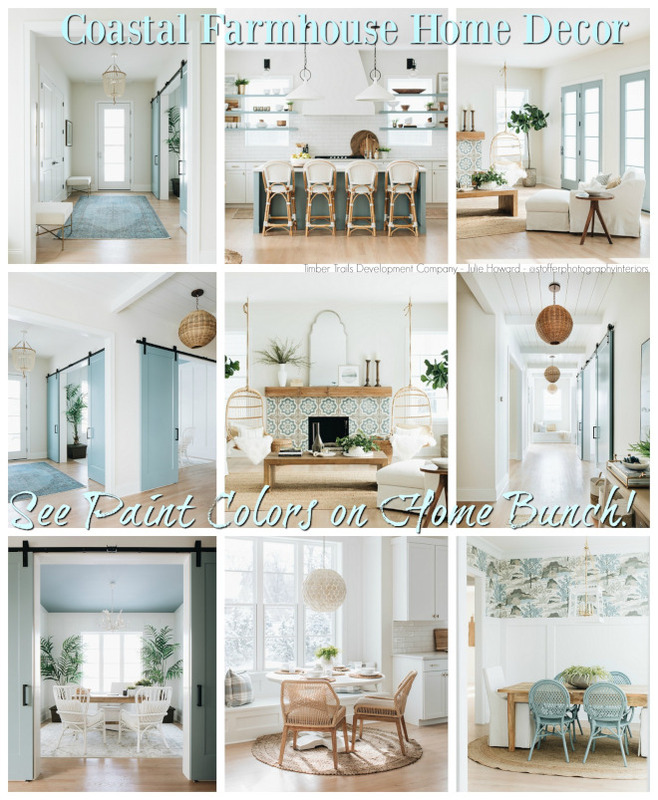 If you are looking to paint your home this color, definitely throw up some samples at different locations (shade and sun) to ensure you like the looks. As briefly mentioned before, the gutters are genuine copper. It is an upgrade of around $2,500 over aluminum gutters, but WOW. They make such a statement against the dark facade that we knew we just had to splurge on them. Looking now, we don’t think the home would have felt “complete” without the copper. CertainTeed Weathered Wood architectural shingles cover the roof, while a metal accent tops the window awning, a classic farmhouse feature. Beautiful Porch Furniture Sets: here, here, here, here & here. 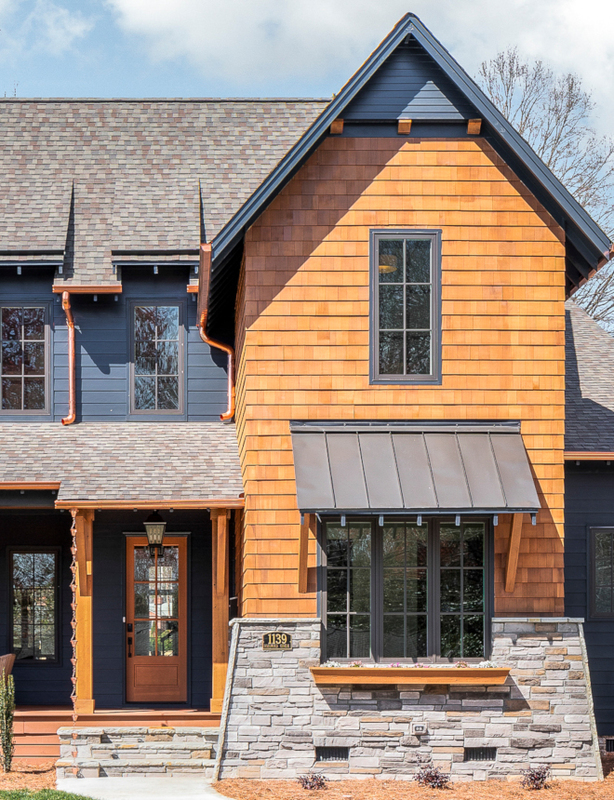 To lighten the facade up a bit and to ensure a focal point of the design, we used cedar shake and a stacked stone wing wall to coat the gabled bump out. A window box adds a feeling of quaintness and homeliness. The shake, as well as cedar columns, a front door are all stained in Benjamin Moore Hidden Valley 50% formula (semi-transparent). The front decking/skirting is Hidden Valley full formula (solid). The front door is very inviting and is made from genuine Fir. We used a Schlage electronic keypad door lock with matching handle, found here. The ease of use and ability to not have to carry around a key is a great added benefit. 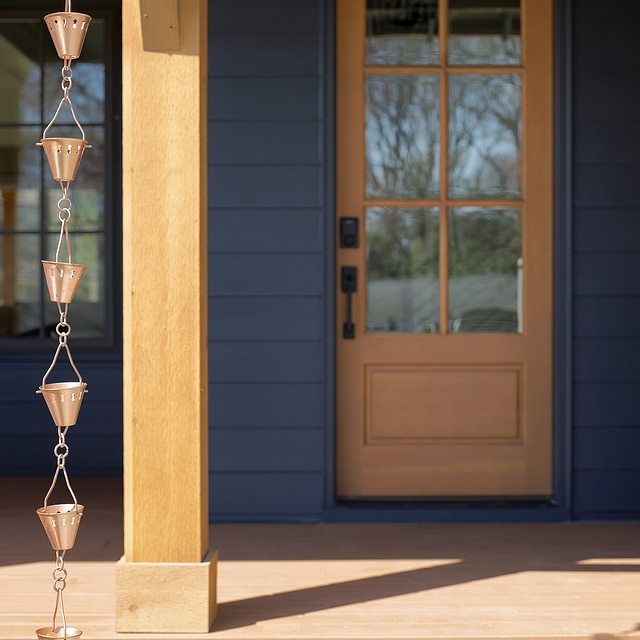 Rain Chains are from Houzz. From this angle you can see the detached carriage house as well as side entrance overhang with custom crafted bracket supports. As you walk into the home, you are greeted by this living space. Located at the front left corner of the home with plentiful windows facing east and south, the natural light is incredible. Access to the rear wrap around porch is granted via the glass door, adding to the farmhouse vibes. Your focal point in a living room tends to be the fireplace, and that is no different here. For the surround we went with a curved trim detail that supports the cedar mantle. The hearth is black granite. We always paint the inside of the firebox in a heat resistant black paint, as it is much more pleasing to the eye than leaving it tan. This fireplace wouldn’t be complete without the designer tile. Tile: Soho Studio MJ Sabino Asian Statuary Polished & Honed – Others: here, here, here, here, here & here. Paint Color in all the main living areas of this home is Benjamin Moore Dove Wing with trim being Benjamin Moore White Dove. Couches- Discontinued – Others: here, here, here, here, here, here & here. Beautiful Brass Table Lamps: here, here, here & here. Rug: Jaipur Living – Others: here, here, here & here. 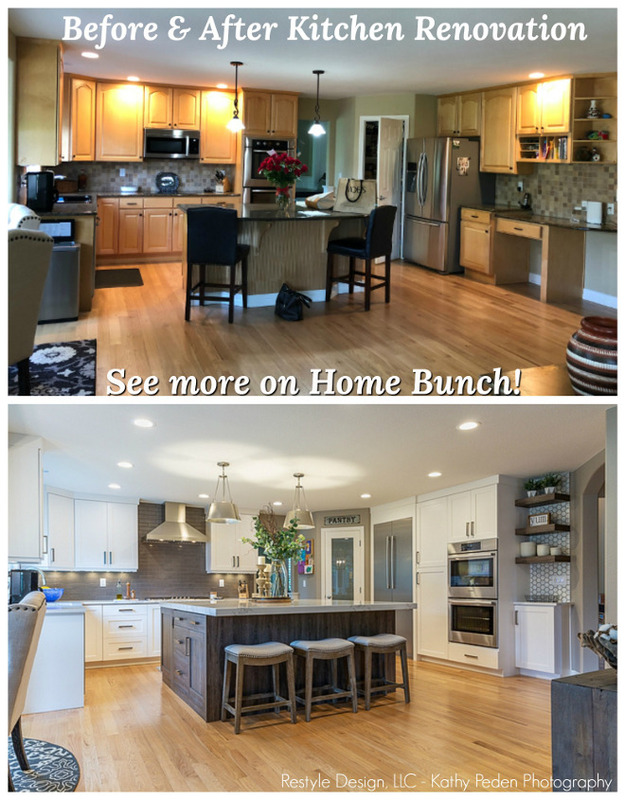 Taking some of our favorite elements from previous kitchen designs and blending them created the masterpiece that you see here. 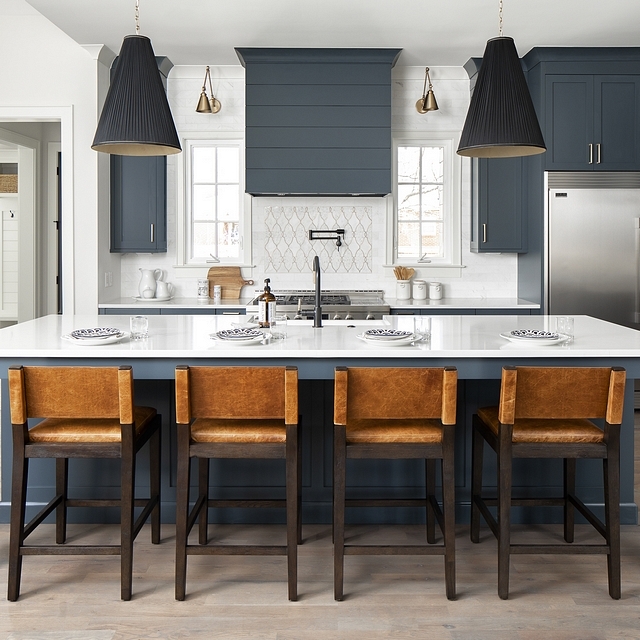 A Modern Farmhouse kitchen that possesses both Modern and Farmhouse ingredients and feels warm and welcoming, while sustaining that ever so slight feeling of exquisite luxury. 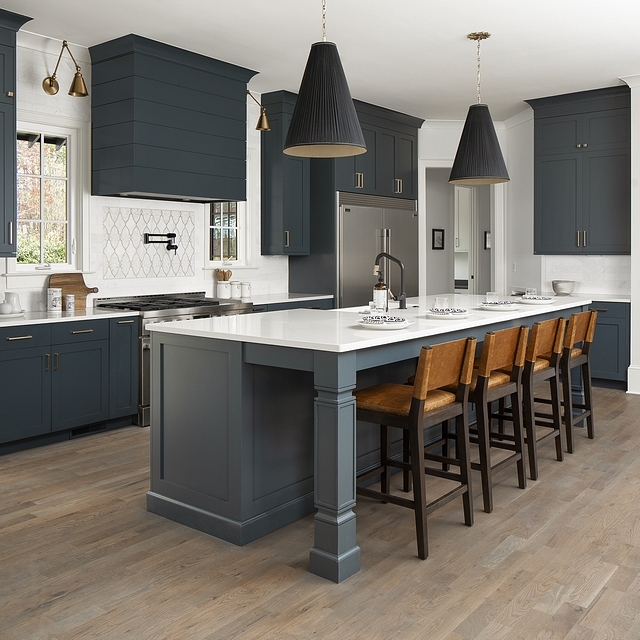 Navy cabinetry is trending big right now, and for good reason. 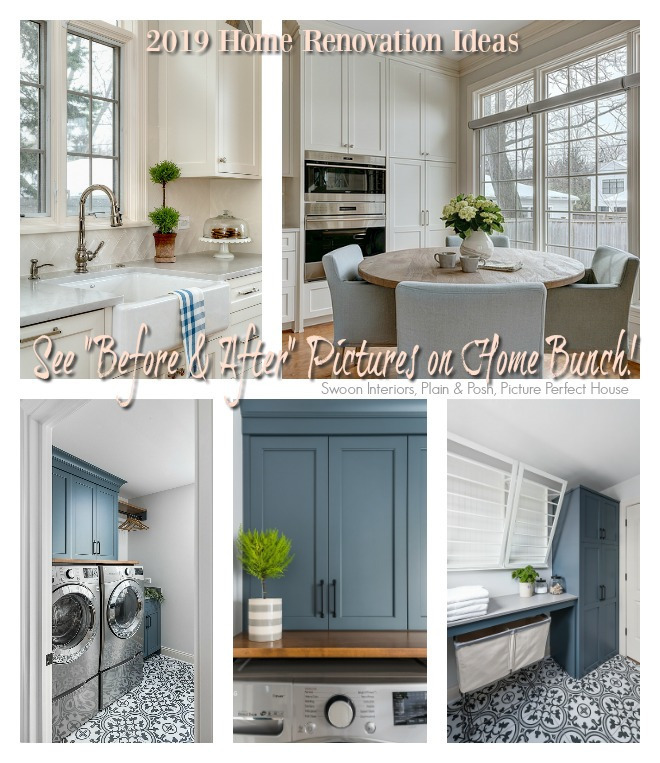 We went with that trend and painted these custom cabinets in Benjamin Moore Lead Gray. Although the color refers to Gray, they are truly a gray/navy. This tone is perfect because it isn’t too deep or bright of a navy that would lend itself to be too casual or unsophisticated. These cabinets were custom made by a local Charlotte shop. The 10′ center island anchors the kitchen and creates a natural gathering spot. It is topped off in a white Quartz that contrasts beautifully against the cabinetry. Speaking of contrasting, we feel that the brass accents in this space pull everything together so wonderfully. 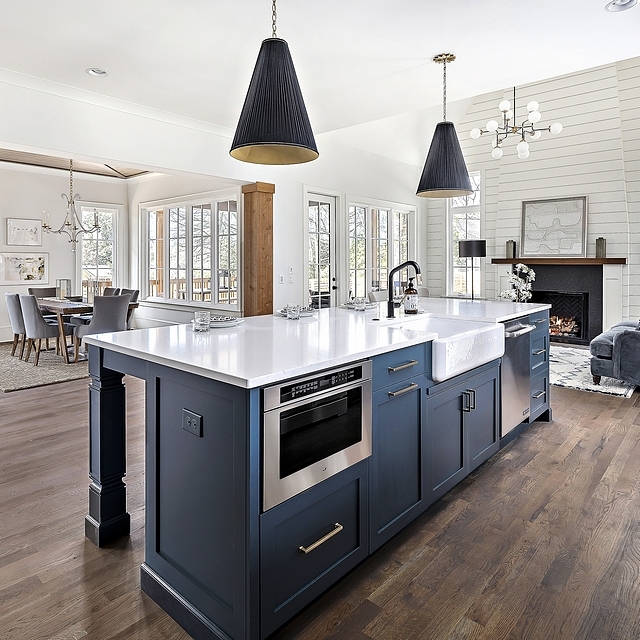 The custom range hood really exemplifies both Modern and Farmhouse elements. Making it squared off with hard edges and no flare and or trimmed edges, it is a very modern statement piece. Add in the shiplap look and you have the epitome of a Modern Farmhouse range hood. Counterstools- RH – Others: here, here, here, here & here. From this angle you can more thoroughly appreciate the great expanse of the island. In addition, to keep scale with the rest of the kitchen, we choose a jaw dropping 60″ French door refrigerator! It comes in two separate pieces, the fridge and freezer columns. Sconces Flanking Hood: Savoy House. This may just be one of the most beautiful tiles we have ever seen before! The striking intricacies and brass branding is truly special. We went with a simple marble tile for the main backsplash that is full height up the wall, and then for the picture frame accent we splurged big time for this amazing tile. It was quite worth the extra money! Accent Tile- Soho Studio Empress Helena – Others: here, here, here & here. 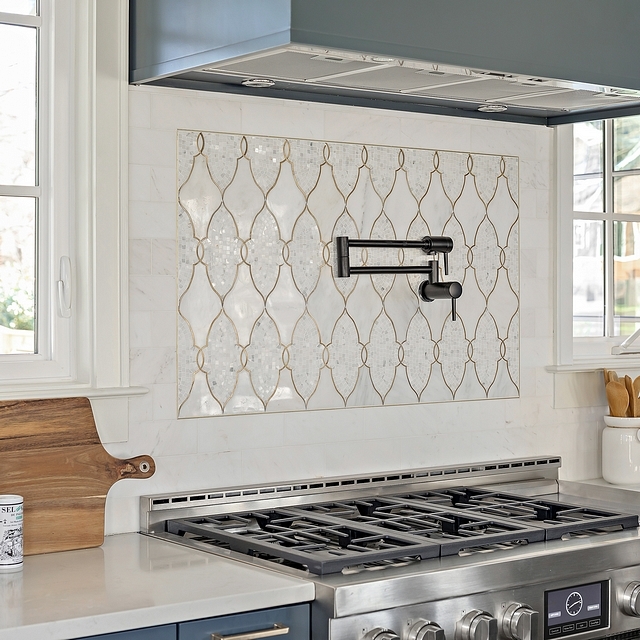 Main Backsplash Tile- Jeffrey Court Wall Street White 3×9 – similar here. Pot Filler- Delta Contemporary in Matte Black. Faucet is Brizo Litze in Matte Black with Brilliance Luxe Gold. Pendants are Hudson Valley Blake in Aged Brass. Other Beautiful Lighting: here, here, here, here, here, here, here, here, here, here, here & here. This angle of the kitchen is truly stunning. It shows off the open floorpan between kitchen, keeping room, and dining area. Windows galore offer loads of natural light. The space elicits warm and cozy feels, as a Modern Farmhouse should. This home is certainly perfect for those who love to entertain. To the left of the apron front farm sink is a trash drawer with two built-in bins, a functional upgrade. With the press of a button, the Jenn-Air microwave drawer opens up and allows you to easily drop in whatever it is that needs heating up. Hardware: Cabinet Hardware is all from the Emtek Alexander Collection in various sizes. 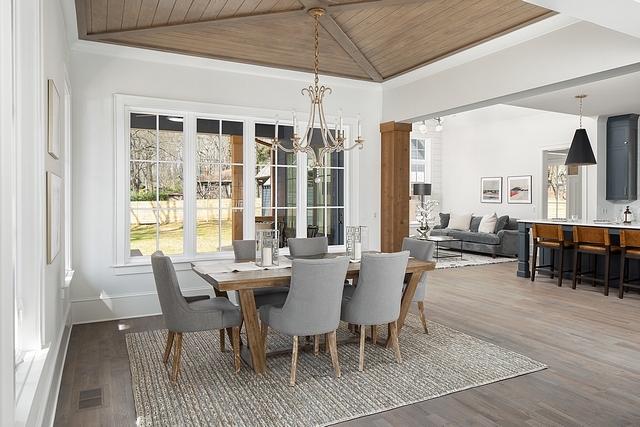 This dining space serves as the sole dining area in the home. It is the formal dining room, the breakfast room, and everything in between. 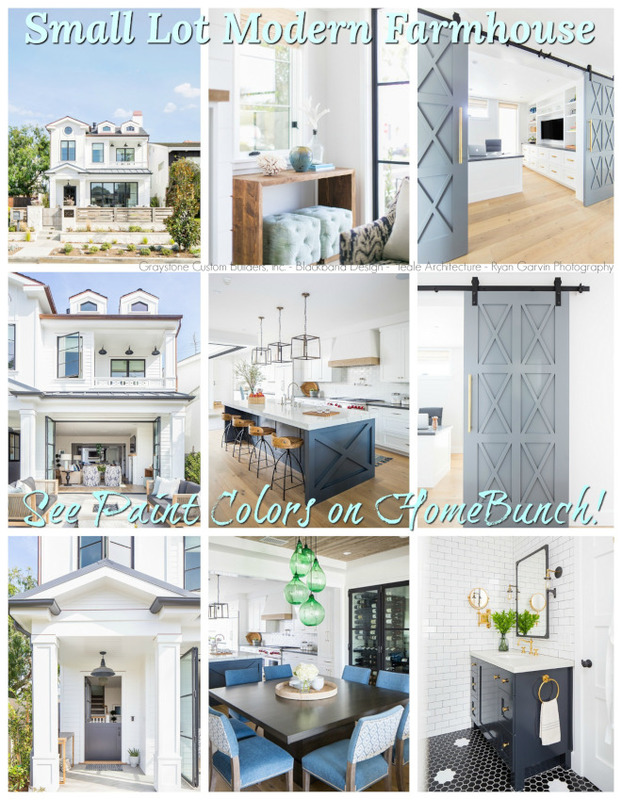 Is the formal dining room going out of style? In many cases we tend to say yes. With that said, it was important to ensure that this room maintained elements of formal and informal design. 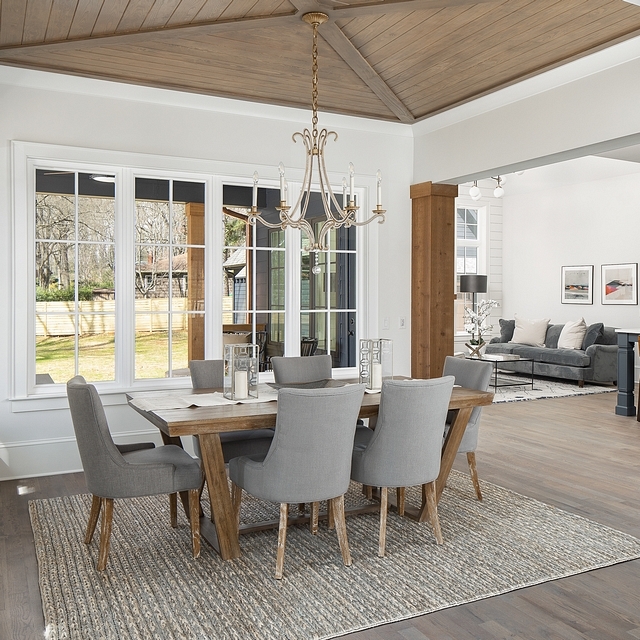 The open concept ensures some informality, while a striking chandelier and stained ceiling trim detail keeps the formality in check. 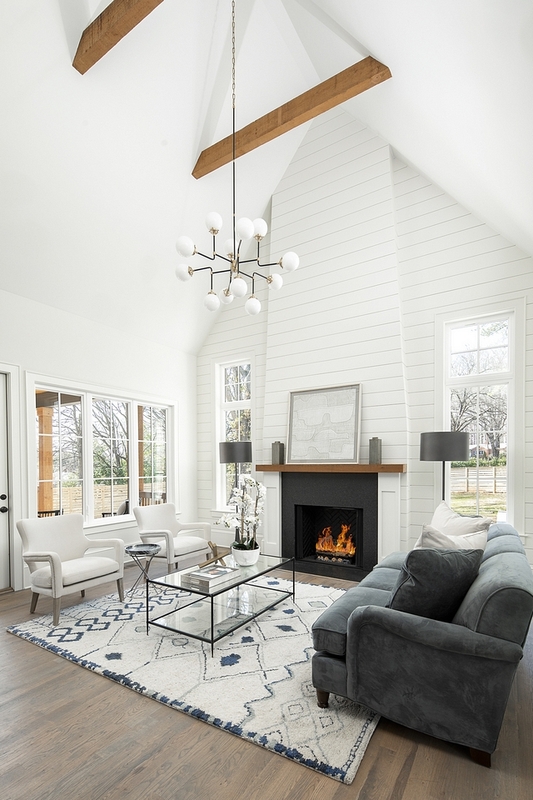 From a standpoint of being in this room in person, we would say the stained wood ceiling accent trim is what really sets this room apart and causes visitors jaws to drop. Take that away and it is a typical dining room. This is a prime example of our belief in going a little above and beyond the ordinary to create spaces that are truly extraordinary. This dining space is perfectly situated overlooking the backyard as well. Wow! Chandelier- Visual Comfort EF Chapman Oslo – Others: here, here, here, here & here. Dining Table- Jeffan – Others: here, here, here, here & here. Dining Chairs- Joss & Main. 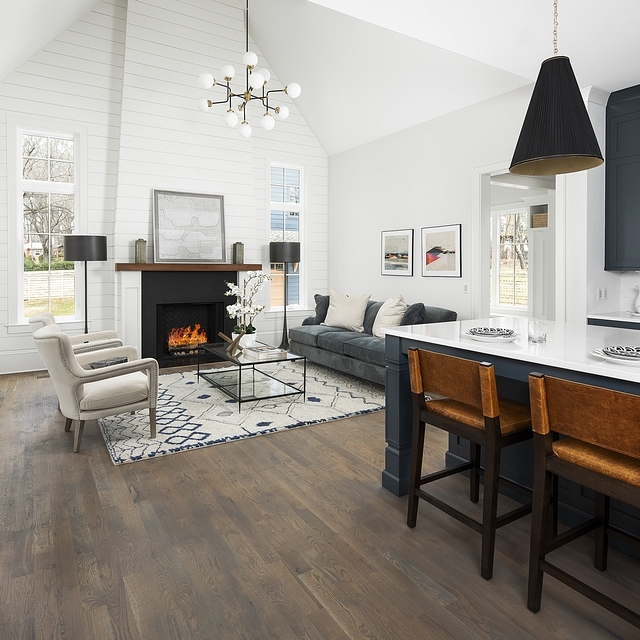 We will dive into the Keeping Room next, but first we’d like to take a moment to talk about the wood flooring that spans throughout this home. The floors are 3.25″ White Oak site finished with an eco-friendly durable finish called Rubio Monocoat. The name of the finish is Havana. Beautiful Hardwood Flooring: here, here & here. With that history lesson under our belts, we feel like having a keeping room in this home further extends the coziness and livability of this home. While things aren’t like they used to be in many regards, people still have a tendency to gather in and around kitchens, so why not have a cozy spot for them to sit? This ceiling is vaulted 20′ high and boasts exposed cedar beams, keeping things just a tad rustic. When faced with a tall, focal point wall there is almost no better choice than to cover it with shiplap, so we did just that! Something about having that trim and not just drywall enhances the coziness of the space. The second fireplace of the home is more informal with simpler trim and a black granite surround, versus tile. Keeping with the hint of modern found throughout this home is the Visual Comfort Ian Fowler Bistro Chandelier. Coffee Table: Discontinued – Other Beautiful Coffee Tables: here, here, here, here, here, here, here & here. Couch- Discontinued – similar here. Rug: Jaipur Living – similar here, here, here & here . This picture really and truly speaks for itself. This is the sole bathroom on the main floor and functions as the go to bath for visitors. Imagine your guests reaction when they walk into this? Many synonyms for “jaw-dropped” come to mind, no doubt. What we have here is a floating cast concrete vanity that is mounted to the wall. It is a custom made piece but shockingly costs no more than an average Restoration Hardware vanity. With no base, your piping is exposed. Luckily they make champagne bronze pipes! 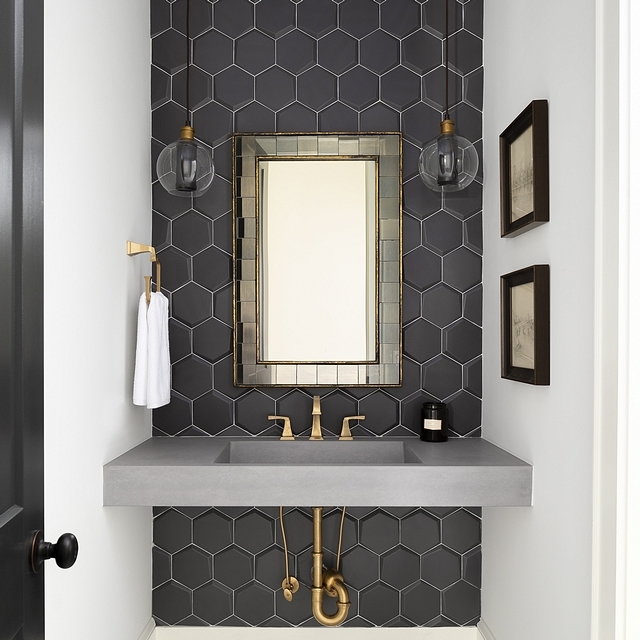 The brass look against the black wall tile is simply unbeatable. Mirror- West Elm Antique Tiled Wall Mirror. Faucet- Delta Dryden Widespread in Brillance Champagne Bronze. Lights- Elk Bremington in Oil Rubbed Bronze/Aged Gold. Tile- Soho Studio Hexagono Cuna Grafito Matte – similar here. 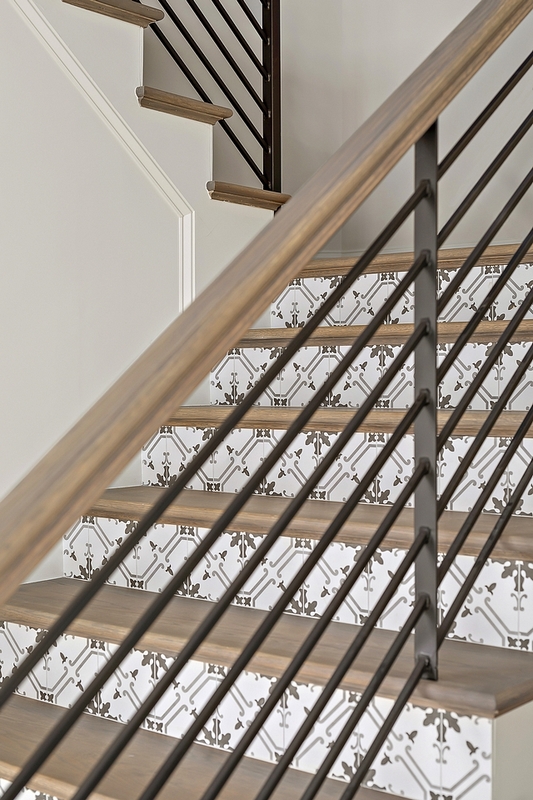 When walking into this home, the stairway is one of the first things you see. That said, we wanted to ensure it made a great impression. This was our first time doing tile risers as well as our first time using metal railings. Well, it certainly won’t be our last. We love the look and think you will too! Tile- Jeffrey Court Acquerello Palermo Field Tile – Others: here, here, here & here. 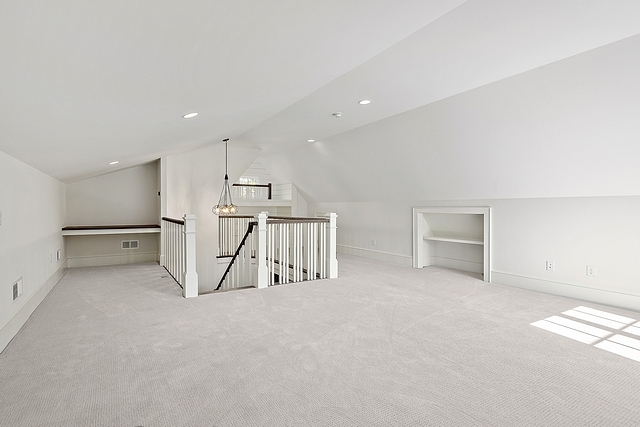 It is a great added benefit to have this finished space on the 3rd level that would have otherwise been unfinished attic space collecting dust. It could be used for a variety of uses like a media room, billiard space, exercise room, etc. We even incorporated a built-in desk perfect for kids homework or a crafting table. Paint- Benjamin Moore Dove Wing. Are the kids having a sleepover? Well, we’ve got you covered. These built-in bunks are not only functional but also stylish. Carrying in a nautical theme makes them feel like ship bunks. 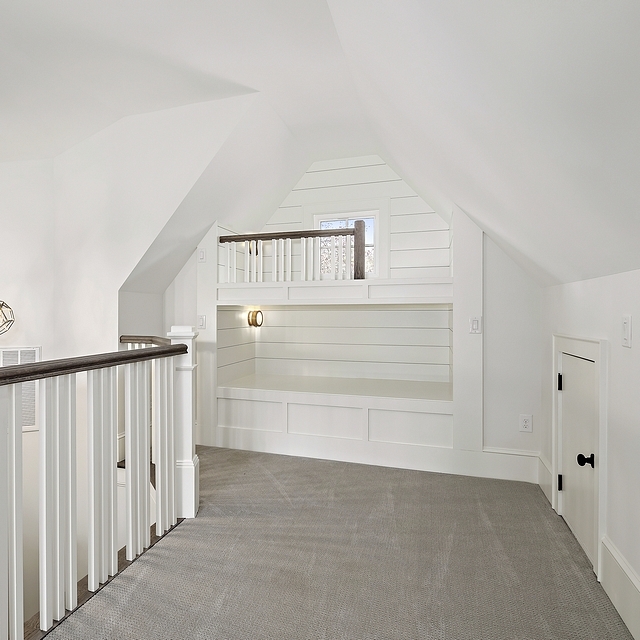 Fun fact: Inside that small door to the right is a kids play nook with lowered ceilings! Lights- Hinkley Mercer in Heritage Brass. This bathroom is great for kids. It is connected to a secondary bedroom as well as the hallway to service a bedroom across the hall. Plenty of countertop space and drawer storage abounds. 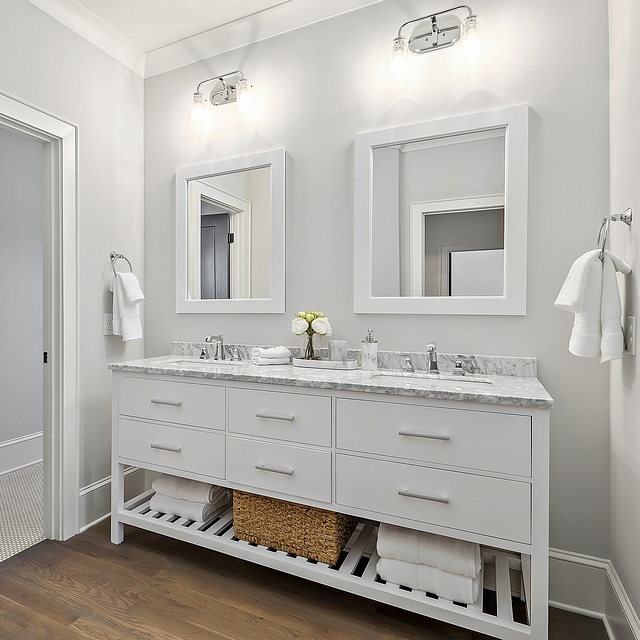 Carrying the hardwoods into the bathroom is a great look, especially given the white furniture vanity. Vanity- London 72″ Vanity from Houzz – also here. Faucets- Delta Ashlyn 8″ Widespread in Chrome. Lights- Kichler Braelyn in Chrome. An en-suite bath, this is the private bathroom to one of the secondary bedrooms. 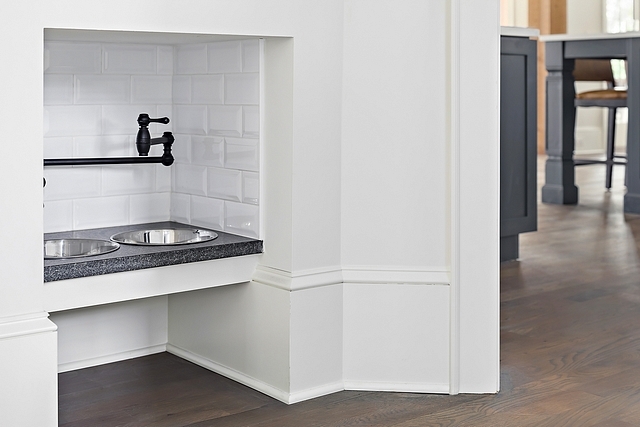 One of our favorite elements is the basket weave tile in black and white. It has a 3D look to it in person, and takes you back to earlier, simpler times. Floor tile- MosaicArt Epic Basketweave Matte from Florida Tile – similar here. Shower wall tile- Dorian Streamline 3×6 Arctic White from Florida Tile – here. Vanity- Scott Living Canterbury 36″ from Lowes – Others: here, here, here, here, here & here. Mirrors: 45.5-in L x 33.5-in W White Beveled Wall Mirror. Lighting- Kichler Braelyn in Chrome. A relaxing oasis was created with the use of neutrals and earth tones. This room features abundant sunlight throughout most of the day, and is just the perfect spot for an afternoon recharge. 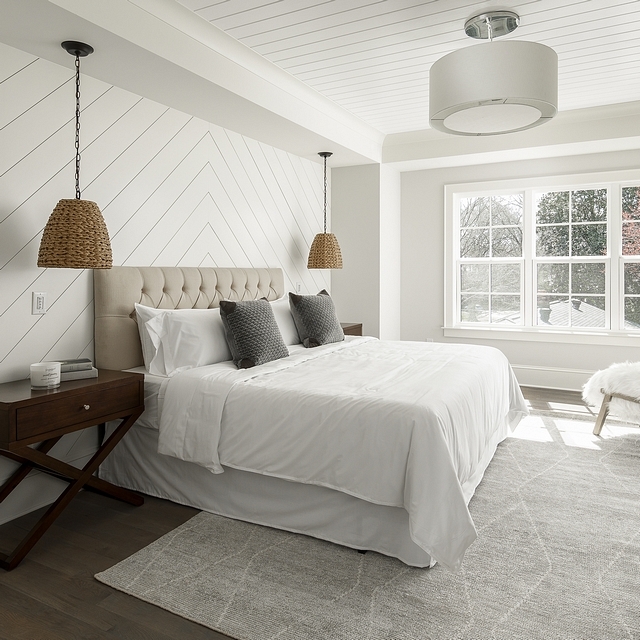 The diagonal shiplap accentuates the recessed bed wall. If the shiplap isn’t enough, we also put V-groove on the tray ceiling inset! Wicker Pendants- Mistana Durrant 1-Light Wicker Outdoor Pendant – Also available here. Ceiling Chandelier- Crate and Barrel Finley. Bedside Tables- Joss & Main – Others: here, here, here, here, here & here. Recommended Bedding: here & here. Chair- Uttermost – similar here – Others: here, here, here & here. This is the home of absolutely gorgeous bathroom vanities it so seems! What a great way to start your day each morning. Get out of bed and splash some water in your face in front of this beautiful accent wall. With this bathroom overall, we went with a more so coastal theme. The blues and whites abound. It is truly causal elegance at its finest. With such pretty tile, we wanted to hide the least of it possible with mirrors. That led us to these beautiful and unique round mirror that hang with leather straps. It’s also a bit nautical which was fitting. 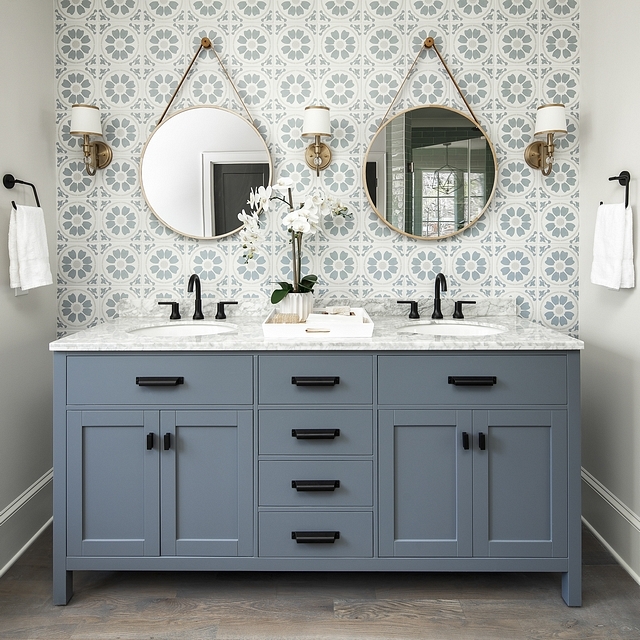 Vanity- London 72″ in Grey from Houzz – Others: here, here, here, here, here, here, here & here. 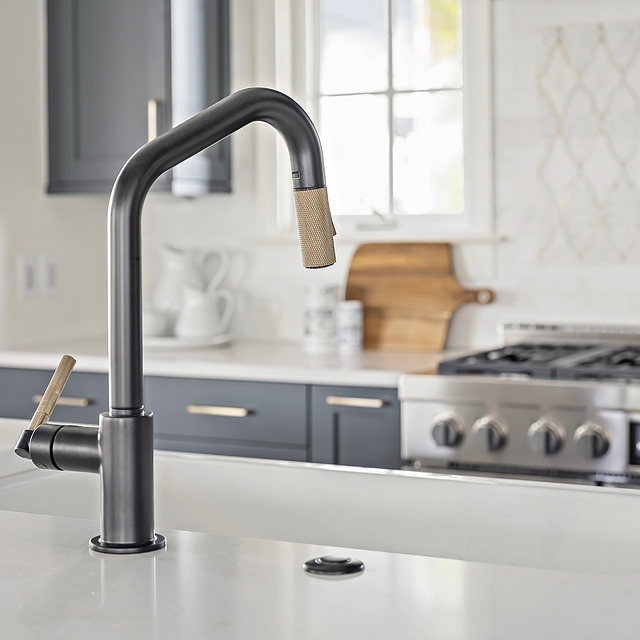 Faucets- Delta Trinsic 8″ Widespread in Matte Black. Mirrors- West Elm Modern Hanging Mirror. Tile- MSI Surfaces Tamensa Porcelain. Feel like a king or queen in this rectangular freestanding tub raised on an elevated platform. Doing a small raised platform where the tub sits helps to define the space. The tub goes from feeling inside the bathroom, to having its own defined space that feels separated. Stylish cedar floating shelves are perfect for candles and towels. Romantic evening, anyone? Faucet- Delta Trinsic in Brillance Champagne Bronze. Chandelier- Hinkley Astrid in Metallic Matte Bronze. Carrying the coastal theme onward, we went with this bold and beautiful baby blue tile for the master shower. Adding the brass banding and brass hardware really compliments the look. 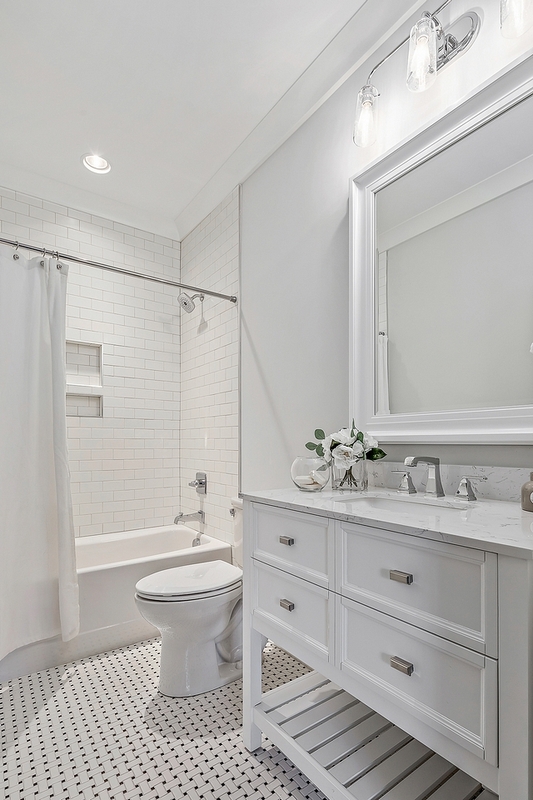 To not overwhelm the eyes, we went with white/grey tile on the floor. This shower has the rain head as well as a wall mounted head that is not seen in this photo. Don’t miss the peek of the owner’s bedroom. Tile- Soho Studio Rumba Ash Blue – Also here – Other Tiles: here, here, here, here, here & here. Shower Floor Tile: here – similar. Heading inside from the detached carriage house via the side porch entrance you are welcomed by this space. Have muddy shoes? Is it pouring rain? Whatever the case, these floors are meant for handling anything. Durable brick tile from Jeffrey Court ensures that you don’t ruin your floors and allows for easy cleanup of messes. On top of that, it is simply stylish, especially when laid in this herringbone pattern. 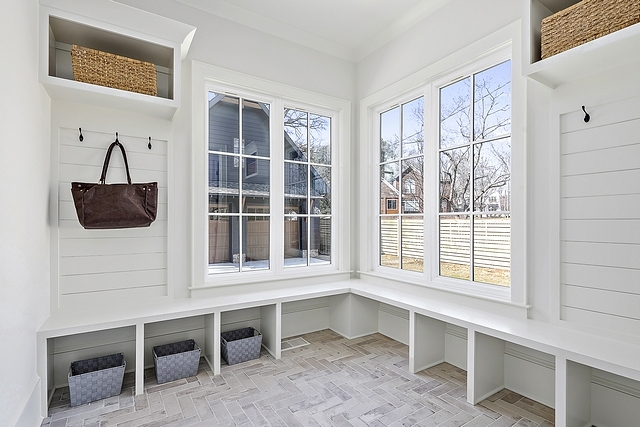 In all honesty, having a brick floor in a mudroom just feels right! Hooks and cubbies and a built-in bench add all the functionality you expect from a drop zone. We didn’t have to add the shiplap backing but we figured, why not!? 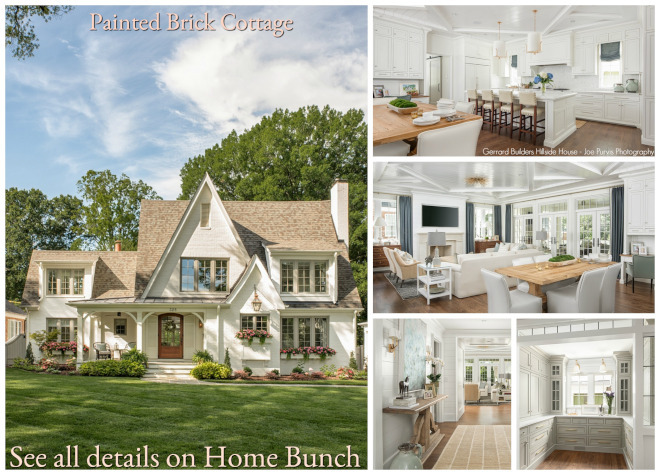 Brick Flooring: Jeffrey Court – similar here & here. Everyone needs a spot where the junk and extra stuff can be hidden away. Everyone needs a room where they can retreat to in order to get things done. This computer cove, or small home office space is just what the doctor ordered. Located off the back hallway through a pocket door, is this handy room. 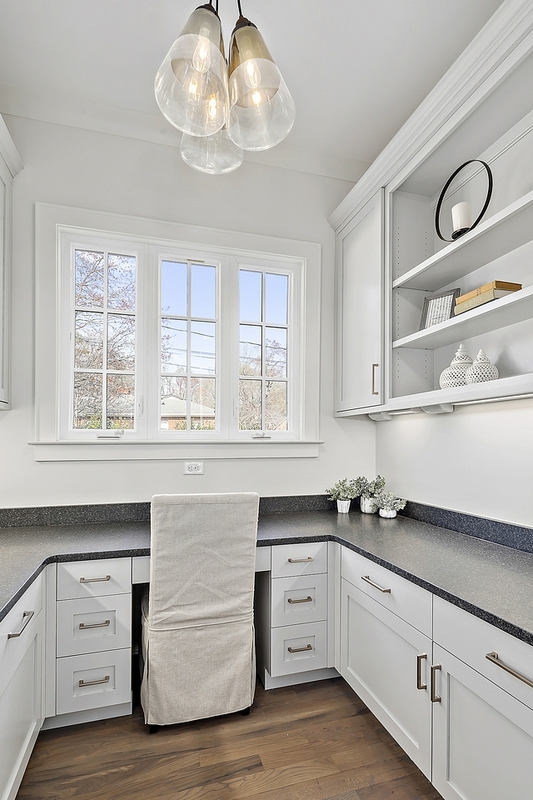 Plenty of built-in cabinet space for extra storage and granite countertop space for accomplishing work. Cabinet Color- Benjamin Moore Gray Owl. Light- Feiss Waveform Mini Pendant x3 with ceiling mount. One of our favorite sizzle features to add into our homes is what you see here! It is relatively cheap ($500-$750) and is such a cool WOW factor and talking point. It is a ledge that is framed and trimmed out and topped in granite with stainless steel bowls set in. Tile lines the walls to prevent water as your dog splashes with their tongue from messing up your wall. A pot filler makes it super simple to refill. How cool is that!? 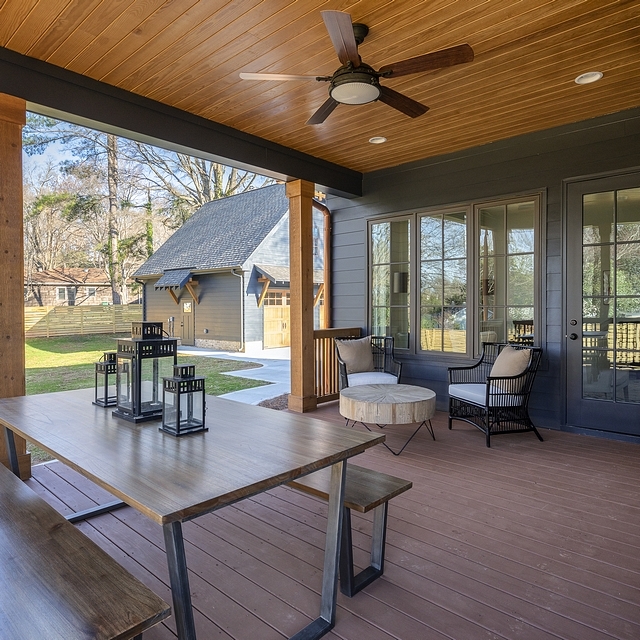 A Modern Farmhouse wouldn’t be complete without an expansive covered rear porch. 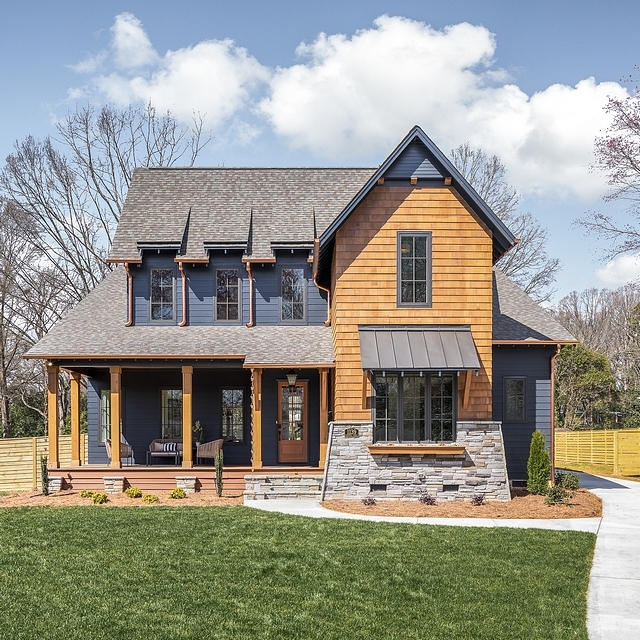 With access from the keeping room and dining/living space it is easy to take a step out and enjoy the amazing North Carolina weather. With room enough for dining and sitting, there is no limits with what you can do with this space. It overlooks the flat rear yard which is very large for an in-town location! Ceiling Stain- Benjamin Moore Hidden Valley Semi-Transparent. Decking Stain- Benjamin Moore Hidden Valley Solid. Beautiful Outdoor Chairs: here, here, here, here & here. 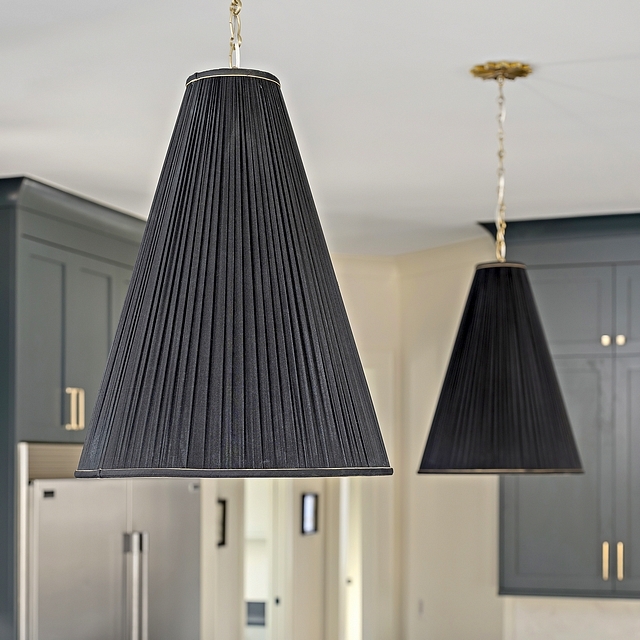 Fan- Kichler Hatteras Bay Oversized in Distressed Black. Outdoor Dining Furniture: here & here. Front Door Light- Kichler Mount Vernon Hanging Lantern. That is a direct quote from our Instagram post of this photo, and we feel it really evokes the emotion this homes brings into peoples lives, both those inside and those passing by. Many thanks to the builder for sharing the details above! 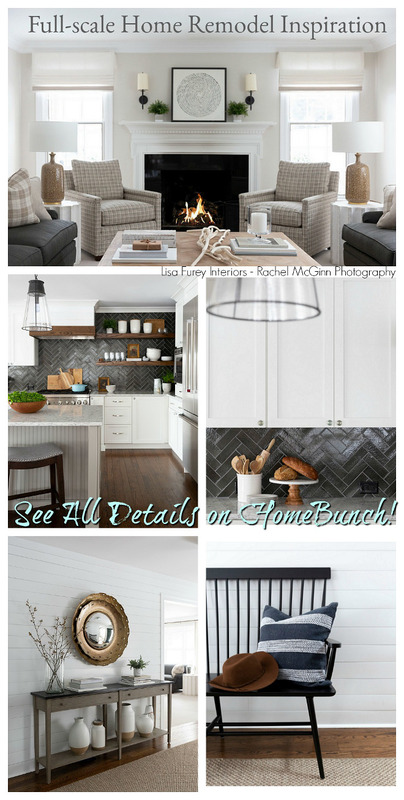 Home Staging: Jenna Jackovich, Style Fix Staging. Serena & Lily: 25% Off Outdoor Furniture! Wayfair: Up to 70% OFF – Home Remodel Sale!!! Joss & Main: Warehouse Clearout – Up to 70% off! One Kings Lane: High Quality Design Decor for Less. West Elm: Best time to shop. Up to 40% off Everything!!! Anthropologie: See the super-popular Joanna Gaines Exclusive line! Nordstrom: Up to 40% OFF. New Easter Decor! Arhaus: Dining Sale. Up to f0% OFF! 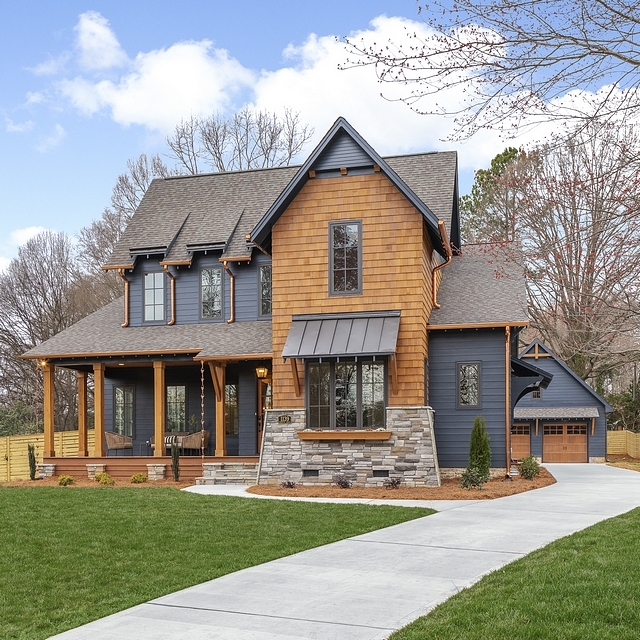 Modern Farmhouse with Front Porch. Connecticut Beach House. 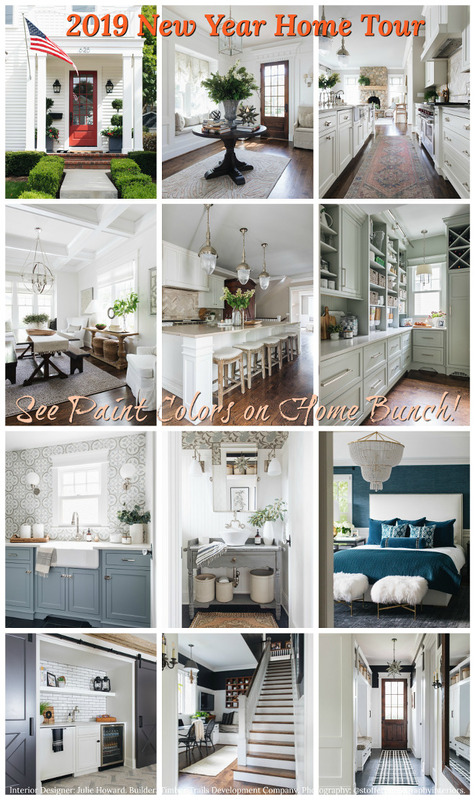 Grey Kitchen Paint Colors.